My home made 100% cotton napkins. The ones in the fan are small, the larger ones are at the front. I'm trying to do without as many "disposable" products as I can. These things have become so entrenched in the way we live our lives now that we see them as normal. They aren't. I looked up the meaning of the word "dispose" and it means: cast aside, chuck out, discard, fling, throw out, throw away, toss out" etc. The trouble with "disposables" is that when we cast them aside or chuck them out, most of the time that means they're in a landfill rubbish dump somewhere taking years to decompose. In the case of disposable nappies/diapers it is believed to take about 200 years. Of course, no one really knows as they haven't been around for 200 years for any to have decomposed completely. Maybe they don't decompose at all, maybe a future earth will be full of slowing rotting but ever present dirty nappies/diapers. Ugh! There is a huge problem in Australia, and around the world, with marine life eating and being tangled in plastic ropes, bags and sheets. I have seen photos of turtles with plastic embedded in their shells and photos of dead dolphins, strangled with plastic. If you don't know there is a problem using plastic by now, you must be living in a world with no newspapers, TV or computers. Plastic kills. There is a big problem with the carbon emissions caused by the manufacture, transport and disposal of paper products. Products like tissues, paper towels and plates, toilet paper and napkins. These products tend to decompose fairly rapidly, if they aren't coated with plastic, but they are still a concern because of the carbon emissions they cause and the forests that are cut down to create them. So here at my little homestead, I'm trying to get rid of as many "disposables" as I can. I've already given up plastic shopping bags and have my own shopping totes, I've made little net bags for small items, we've given up paper towels and use old terry cloths and newspaper instead and I always try to buy products with the least amount of packaging. A couple of years ago we gave up paper napkins, but over that time we started using the convenient box of tissues sitting in the kitchen to wipe our mouths while eating. Now that's stopped. I've made a few simple cotton napkins that are suitable for everyday use and that's what we're using instead of tissues. I would love to give up tissues completely, but I can't bear to wash handkerchiefs, but if we can reduce our usage of tissues significantly, I'll be happy enough. We used too many of them as napkins, so I'm pleased we've stopped doing that. This little basket of homemade napkins now sits on my kitchen bench. If I had babies now I would never put them in disposable nappies/diapers, and if I wasn't post-menopausal, I'd be using a Diva cup or home made pads. I'd like to present some information about reusable nappies/diapers and homemade pads, and I am hoping to get a friend to write about these things so I can post some good info for you. Have you conducted "disposables" audit in your home? Have you given up using "disposables"? I'd love to hear your stories in the comments box. This is probably more TMI, but quite aside from the environmental concerns, cloth pads are /so/ much nicer than disposables. I'm sure more women would convert if they only knew how much more comfortable they are. Ah, Rhonda this is something I've been working on too. We've done much the same things as you in a bid to cut out disposables. I have a holder of cloth table napkins on my dining table all the time and it amazes me that people will ask me if I have a tissue or some paper towel because they don't want to dirty the cloth ones!!!! I have come to hate the smell of the toilet after a day of not flushing and decided to collect our urine in a bucket and use it to feed our fruit trees. Then I cut up some small squares of flanelette, folded them over and did some zig-zag stitch around the edge to neaten them and stop fraying. I store them in a little tin kept next to the toilet and use them instead of toilet paper after urinating. They are then collected in a little bucket and washed the next morning. I hand wash them in a small amount of water with a drop or two of tea tree oil and of course some soap and then I dry them in the sun. I find them far softer to use than the environmentally friendly toilet paper we use for ahem no. 2s. I got that same look from K when I broached the subject and I have to admit I was relieved. I've been using cloth napkins for so long, I've forgotten when I started. Both of my daughters' grew up with them so use them in their households, too. I use cloth pads too and LOVE them. I've been using them for about 12 months now and wish I'd known about them sooner. They really are so much more comfortable and I feel so much better about not having all those chemicals so close to my body. I made my own from old cloth nappies and some flannelette material I had leftover. So far they've basically cost me nothing to make (all bits and pieces I had on hand). We still use some tissues and paper towel, but not a lot. Can't remember the last time I had to buy a pack of tissues. DH is actually getting a stash of new hankies as part of his father's day present. LOL. His request. Clarification: suggestions about how to clean up the kitty puke, not how to prevent the puking - sorry it sounds a little confusing. Ha, Rhonda, great minds think alike, check out my post thismorning!!! However, your post is much more knowledgable, mine is just a rant and rave!! Being "almost" menopausal, I am interested in the cups, that time of the month is very unpredictable just now, and sometimes very heavy, would they work well I wonder? I just love your site, so much interesting and useful information. I have mixed feelings about hankies, mainly from childhood. My mum always had one tucked in her bra strap or up her sleeve, and that used to drive me mad. My dad on the other hand always had a great big one in his pocket which was useful for all sorts of things, and I loved those. 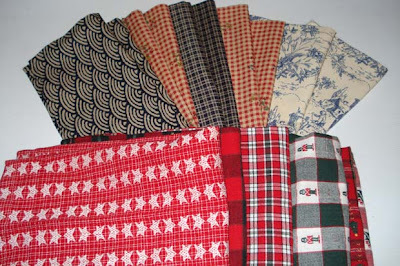 Whenever we got a cold we would raid his hanky drawer for the biggest, oldest, softest hankies to save our sore noses. As a child I learnt to iron on the hanky pile. The pile was just big enough to be worth doing, but not so big it seemed a chore, and the neat pile at the end was always very satisfying. I practiced embroidery stitches putting initials in the corners of my hankies. I learnt to crochet and tat making borders for hankies. I carried one of my late grandmother's beautiful old linen and lace hankies when I was married. I still have these tucked away in a memory drawer. On balance I think hankies are pretty darn good. Part of that group of lovely soft sweet-scented family linens. Perhaps boiling them in a big pot on their own, like they used to do in a copper, would be a solution for you Rhonda? This is supposed to be very good for tea towels as well. I think the only disposable paper products we use are toilet paper and waxed lunch wrap. I have never been a tissue person although if we are having a time when everyone has a cold at once and I can't keep up with washing hankies I buy tissues but no one likes using them. We have always used cloth napkins and have the same experience as Polly with visitors especially my mum not wanting to dirty them. I am a recent convert to cloth menstrual pads. The only thing I would ever have used kitchen paper for would be to drain fried foods on and for that I use saved butchers paper or recycled paper bags. We don't have any plastic wrap in our house but I do use recycled plastic bags to cover things in the fridge, I even wash them and use them again unless they have been used for meat or dairy products. When they have been used several times and are getting holey I chop them into little pieces before they go out in the garbage. My biggest bug bear is plastic milk bottles. What do other people do with these. I put them out for recycling but I hate buying them in the first place. Whoever asked about cleaning up pet vomit, I use one of our old cloth nappies and then rinse the yuck of it with the hose outside, soak it in hot water and then wash with any other yuckies, I do the same for kitten puddles and poo is cleaned up with toilet paper. alexandra, I'm sure they would too, if only we could get more women to try them. polly, I love you! Thank you for your comment, it's exactly what I was hoping for. I hate the smell of the toilet now too, and the stains it gets when you leave the urine in there most of the day. e invested in a new toilet that allows us to flush with less than a cup of water, instead of the 11 litres we used with the old toilet. I would like to take that further though and I love your little flannelet squares idea. Hmmmmm. ali, maybe you could use polly's idea of the cloth squares. lightening, isn't it frightening how many chemicals we do put on ourselves. I wonder how many others we don't know about. Jill, I contacted my friend this morning about writing some guest posts. Hopefully I hear back soon. One will be about the diva cup/the keeper and cloth pads. marg, I remember my mum with a hanky up her sleeve too. Like you I grew up with hankies, but having working with patients with respiratory diseases, I've never been able to look at a hanky in the same way again. I do love the old embroidered ones. One of my mother's last gifts to us all was a set each of embroidered hankies. I still have them all. Jenny, I stopped buying plastic wrap last year but it shows you the power of my stockpile, because I still have several rolls of it in my cupboard. I use it, but very rarely. I've cut down a lot on buying milk. We usually have one bottle a month now. The rest of the time I use powdered milk. I so use the plastic bottles in the garden sometimes or as scoops for dog or chook food. I hope someone comes up with a good solution to this that we can all share. Wow you have sure given me some food for thought! I haven't used hankies for years mainly because I hate washing them too, although hubby just uses his for work and they hardly get used! But I do get a real kick out of ironing them nice and neat as I too learnt how to iron using hankies and teatowels! I always remember my gran and mum having a hanky stuffed somewhere under their top, or tucked in their skirt waist! They were also used to wipe or cover up any wounds that occured out in the paddock etc. My mind is now ticking over with all the other suggestions of the day! We use cloth napkins daily, and I use them when I entertain. It amazes me the number of people who will bypass the cloth napkin and pull a paper towel off the roll (I've tried giving those up, but got THE look from dh). When I encourage them to use the cloth the response is always "oh, I don't want to mess it up." From now on I'm hiding the paper towels! Having spent the last six years changing umpteen nappies and wiping hundreds of runny noses every day, you would think I am immune to bodily fluids, LOL! I *love* the comfort of cloth pads and routinely use hankies (except when we are sick) but I just can't come at making my own toilet wipes. I have no idea why I consider it any different to washing dozens of nappies, but there you are! Odd isn't it? *Shrugs* Can I ask what model your new ultra-low flush toilet is? I use the cloth pads, and I too think they are more comfortable. We also use cloth nappies(or diapers here in the states). We've gone to cloth napkins, and use cloth dish rags to clean the kitchen. We mostly use plastic food storage containers rather than those plastic baggies. I save the little and medium sized containers from sour creme and cottage cheese. They work well for small amounts of food. Great topic! More people need to try cloth. It saves money and really helps the environment. I can honestly say I would rather use the little flanelette squares than toilet paper now but I can't imagine ever eliminating toilet paper all together because I'm not going to start washing visitors' cloths. YUK!!!!! Hi LS, there are some good ideas here. I love it when we put our brains together and come up with innovative solutions. Hi Julie, good to see you again. The new toilet is just a normal dual flush toilet that H fiddled with so it just lets out a three second burst of water and stops. It gets rid of the pee but uses about a cup of water doing it. Alexandra, it does my heart good to know that more and more people are thinking about their choices and moving towards environmentally sound ways of dealing wtih household cleaning. Oh what a great idea. I can't sew to save myslef. Never used a sewing machine in my life. Love the idea of washable table napkins. What do you use for your kitchen garbage? I used to use plastic grocery bags, and have also recently switched to totes, but cannot think what I should use for the garbage, particularly in the kitchen, where things are often moist/wet. Any suggestions? About the alternative to milk in plastic bottles: how about buying it in a carton? Cartons are MUCH easier to recycle and are usually turned back into office paper. Most council recycling collections will accept cartons. We don't have paper towels or paper napkins in our house any longer. Took me a little while to get William use to using cloth napkins but now its just natural not having paper. I picked up a lot of cloth napkins at thrift stores and yard sales. I too keep a basket of them for handy access. These are all things we have been doing in our household for years. Cloth pads and a keeper are so much more comfortable than disposables. Cloth TP is also very gentle on sensitive areas. We soak them in a bucket and wash them each evening. We eliminate the smell in the toilet by flushing with hand washing water. Basically every other time you get up from doing your business, wash your hands, get the bucket from under the sink, and pour in in quickly. Now if it is "brown" we just use the regular flusher! Well, how is that for way TMI?! We love our cloth napkins! We use mix matched, matching and some that downright clash with each other, but it always makes for an interesting table. Beautiful napkins, Rhonda. I think my kids might just use the tablecloth... hmmm. We have an assortment of op shop cloth napkins - lovely cream damask ones, bright cottons, delicate prints. But we don't use them often here. I'm the same with you with hankies, but the kids have some which they use, except when anyone's sick - then we use paper tissues. I love using and making cloth pads - they are so lovely to wear and fun to make from offcuts. I love teaching others to sew pads for themselves and their daughters. Or teach the daughters themselves, that's special! We used cloth nappies (now only night-time pull-up trainer type pants with nappy boosters for the littlest ones) - much nicer for their bottoms and the bin! We've eliminated paper towels, paper napkins, and plastic pads at our house. Our only consumable is toilet paper. I started sewing our napkins before we were married and have since made some for our church to use at potlucks. Cloth napkins make meals feel more special. Cloth towels clean up messes much better. And cloth pads--oh they're so wonderful and soft. I look forward to my period now! A couple of ideas on the "wet" garbage. If it's vegie & fruit peelings, coffee grounds, egg shells, plate scrapping, etc, put them in a covered crock or old ice cream bucket and save for the compost bin. Empty this container each day - so you don't get flies, especially fruit flies. If you don't have a compost bin, you can dig a hole in an unused section of your garden and bury it. It will take it a few months, but it will amend the soil. If you have things like banana peels, cut them into smaller pieces to get them to decompose better. If you have chickens, you can let them have everything but the coffee grounds. If you make homemade soap, save your greases, fats from meats and oils in a covered container. Keep it refrigerated. When you have sufficient, place the lot it a pot of water - about twice as much water as fats. Bring this to a boil and let it boil for a few minutes. Then turn it off and let it cool. When the fats harden on top, you can take off this top layer. (You may need to put it in the fridge to get it hard. )Turn this layer over, scrape any bits off the bottom and use the fat for soap. Do knit/crochet dish cloths work better than the store-bought terry cloth ones? It seems like they would be big and bulky. The terry are light-weight. My youngest is 13, but I still have some old diapers laying around. I never thought to use them for "cloths" for me or for bathroom use. Thanks for the idea. I received a cloth napkin in a Mother's Day basket that the boys made in Scouts. I LOVE it. I prefer it to paper! It's nothing more than a square of cloth that someone zigzagged the edges on. Oh, one other thing. I have some links on making you own pads and making your own diapers. But I didn't want to post those without Rhonda Jean's permission. Niki, I recycle as much as I can. We have a separate bin here for that so the things that can't be recycled here, go straight to the recycle bin. I never throw out any pure cotton/linen/paper, it all goes to the worm farm. Food scraps go to the chooks, things like coffee grounds, tea bags, some egg shells, onion scraps, potato peels go either to the worms or the compost. I have a little white bucket on the bench that saves these things and I take them out every morning. But for things that go in the bin for the general garbage I wrap them in newspaper, like a packet of fish and chips. If it's during the day I take that parcel straight to the outside bin, if it's at night, I put the parcel in the little bin I have under the sink, then take it outside in the morning. Hi suz, good to see you visiting. Thanks. Peggy, I've picked up some white linen napkins at the thrift store. They're really beautiful. It's a good source of napkins. Kim, LOL it sounds like we're preaching to the choir. I don't think there is TMI here. It all seems to be accepted for what it is. Thanks for sharing. Knitter, I don't really like things matching. I think a mismatch is much more interesting. Hi Bel! It's good to see you here, love. Did you get my email? Hi Brandy. HA, not many women can say that. Good for you! Hello Darlene. Thank you for sharing all your great ways of dealing with waste. I think terry toweling and handmade dishcloths both clean well. The terry cloths are great as they're generally recycled towels or nappies. The knitted dishcloths last for years and are just a nice thing to make when you want to stay occupied when you're resting, and they make a nice gift. Please, share your links. That's what this blog is all about, people sharing information. This has been an interesting post and comments. I was particularly interested in the cotton pads for the monthly flow. My sister called me when I was reading the comments and I tried to tell her about this post and she was silent. Funny, how this is a taboo subject for many women. Cotton cloths! When I felt the tension on the phone I changed the subject. I know this was the norm when our mother was growing up. Thank you ladies for being so open about this subject. The thought of many women using tampons really is a scary thought. I learn so much by checking into your blog Rhonda. Thanks! Here is a link with a bunch of free diaper, soaker, liners etc..patterns. This site has free patterns and permission to make them to sell! Timely as always Rhonda, I am in the process of stopping plastic wrap and paper towel usage in the kitchen, and DP has many hankies which I am starting to carry now. I have always used cloth napkins as I grew up using them. I use modern cloth nappies for our littlest one. 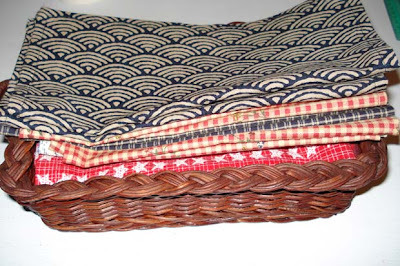 Gorgeous things made from fantastic fabrics like hemp and bamboo (soo soft). However I too get the look when suggesting we use cloth as well. I've been recycling the worn-out, out-grown jeans into a tote bag, a quilt and "refashioned" into a stylish demin/cotton print 3-tiered "Prarie" skirt. Now you've got me wanting to run to the machine and whip up napkins out of whatever we've outgrown that's suitable! I'm really wanting to try making cloth napkins now, but I haven't used a sewing machine since junior high home ec classes... I recieved a hand me down machine about a yer ago and haven't had the nerve to use it. This is just the little project I need to get me rolling I think. Is there any chance you could give a novice sew-er a few hints on how to make napkins? is there perhaps a pattern to use? Thanks for any help. I check your blog for new posts each day.